Use with the VetGun™ to control horn flies on your cattle where and when you need it. The world's first EPA-approved insecticide containing the proven insecticide lambda cyhalothrin. 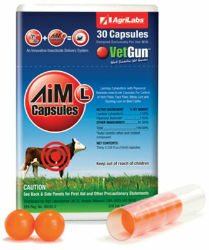 AiM-L™ VetCaps are soft gel capsules for horn fly and lice control in cattle over 600 lbs. These capsules are fired from a VetGun™ (sold separately) at a range of 15' - 30' away. The capsules burst upon contact with the animal to deliver insecticide in a similar way to pour-on products. Simply aim, shoot, and treat. The tell-tale fluorescent orange spot will tell a producer the product is on the animal’s hide. Each AiM-L™ VetCap contains 10 ml of lamda cyhalothrin with piperonyl butoxide. Apply one VetCap per animal. When tested, VetCaps provided effective horn fly control for 4 weeks. Cattle are easily treated while milling around or feeding, without added stress or labor. Allows one person to easily apply insecticide from horseback, pickup, ATV, or while on foot. Saves time and puts you in control of when and where you treat your cattle.